"I am glad that you have mentioned the first stanza of Prayer to Spiritual Master. I think you know the meaning of this stanza. 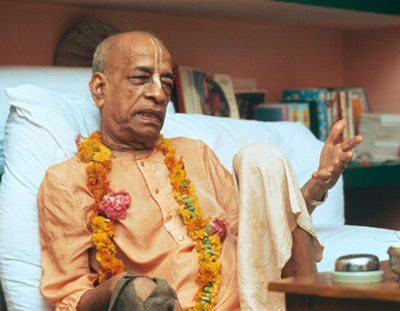 The meaning of this stanza is that, this world is just like forest fire and spiritual master is just like the cloud on the sky, therefore as the fire can be extinguished only by the water from the sky, similarly, one can be peaceful and elevated in spiritual consciousness or Krishna Consciousness only by the mercy of a bonafide Spiritual Master. "The process which you are following is very nice. Your humbleness and sincerity will make you more and more advanced in Krishna Consciousness. I shall pray to Krishna for your welfare always."